Jealousy Incarnate insinuated a dusky forecast as it embarked with showers of criticism due to its controversial pilot episode. However, its distinctive take on the mainstream Korean rom-com coupled with realistic slice of life situations chased away any dark clouds and wrapped it up with sunny viewership ratings. It’s an intriguing story filled with love, hate, and of course, jealousy. Given the contentious newsroom setting, the hodgepodge of health issues, the workplace discrimination, the family feuds, and best friend rivalry, Jealousy Incarnate was able to find an emotional equilibrium between serious issues and lighthearted delivery that really impressed me. It took taboo topics to a completely new level and offered a deeper look at many of society’s stereotypes. It’s certainly an intriguing story filled with love, hate, and of course, jealousy. 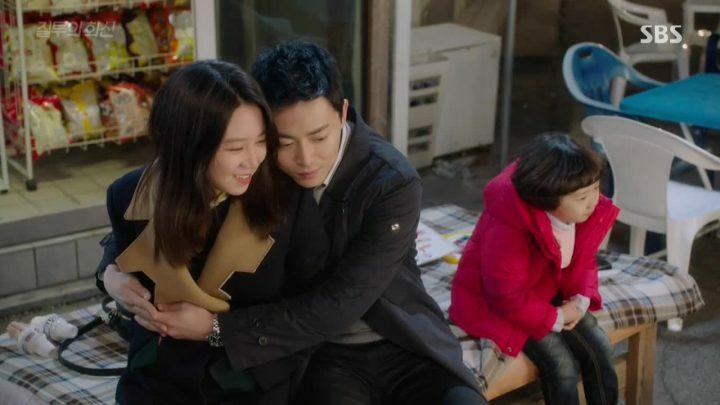 In these initial episodes of Jealousy Incarnate, we’re introduced to the slew of characters and their increasingly complicated connections with one another. Our heroine Pyo Na Ri (Gong Hyo Jin) has had a hard life – from flunking the news anchor audition, to her crave for the often denied respect and recognition at work, to her three-year-old unrequited love, nothing seems to go right for her. But despite the unlucky train of events circling around her, she maintains a positive disposition in life, keeping her contract weather caster position in good record. The prima facie vulnerability in Na Ri felt like a déjà vu of Gong Hyo Jin’s previous role in The Master’s Sun. Her subservience and spontaneity are leaving me either appalled or empathetic, and her desire to please other people in an undignified fashion is quite cringing. However, her struggles for career growth and acknowledgement brought light to her hidden noble personalities, and I became more invested as her bold and frank sides slowly became more apparent. 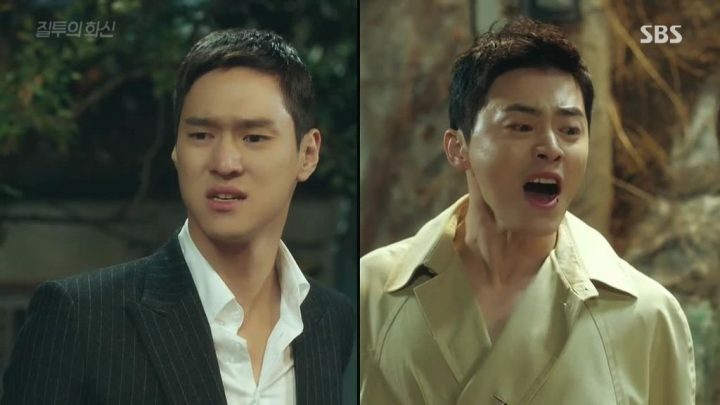 I was even more enthralled by the massive turn of Na Ri’s seemingly wretched fate after kismet interweaved her life with two equally reputable bachelors: star reporter Lee Hwa Shin (Jo Jung Suk), Na Ri’s long-time crush, and his best friend chaebol CEO Go Jung Won (Go Kyung Pyo), who spiked interest in Na Ri after their coincidental meeting on a flight to Thailand. Both guys boast vibrant physical appeals keeping my initial impression of them at par. But I guess Hwa Shin’s abrupt and pompous demeanor made Jung Won’s suave and clear-cut attitude more favorable. As for Hwa Shin, he’s the epitome of egotistical Kdrama male leads. His jerkiness is totally brow-raising, and Na Ri’s one-sided love for him is adding more insult to the injury. It was fun to see her quirkiness create an amusing dynamic with his overweening behavior, though not enough for me to ship them romantically just yet. It was fun to see her quirkiness create an amusing dynamic with his overweening behavior. On the contrary, Jung Won’s forthright yet heedful personality got me circumscribed. I was even more impressed whenever he exudes that knight-in-shining-armor persona to appease our miserable heroine. Our story commences in a series of fateful preludes between the three — unfriendly reunions, romantic disclosures and detachments, tectonic flashbacks, and even bizarre cancer discoveries — firmly entangle them. Meanwhile, more relationship triads and offbeat characters were introduced as the drama went on. There’s the fray between Bang Ja Young (Park Ji Young) and Gye Sung Sook (Lee Mi Sook), Hwa Shin’s ex-sister-in-laws who are rivals in work and love alike. They’re fighting over custody of Hwa Shin’s niece Ppal Gang (Moon Ga Young), and grappling over Chef Kim Rak’s (Lee Sung Jae) affection. Then, there’s the teenage version of the rivalry between Chef’s nephew and Na Ri’s brother Chi Yeol (Kim Jung Hyun) over Ppal Gang. This overwhelming number of relationship conflicts added more spice to the drama and made its concept more fetching. Jealousy Incarnate, true to its title, begins to manifest the green-eyed monster as embodied in Hwa Shin and push the romantic tension to new heights. More fateful rendezvous between him, Na Ri, and Jung Won brought an immense shift to his character. After a series of denial, indecisiveness, and retrospections about Na Ri’s unrequited love for him, the answer became clear – he has fallen in love with Na Ri and is hard hit! However, the tide is set in Jung Won’s favor when Na Ri finally starts to reciprocates his romantic overtures. Though my bet has always been with Jung Won and Na Ri since the very beginning, I felt a sneaking sympathy for Hwa Shin at this point, when his entire world comes crashing down. It seems that Hwa Shin has deemed Na Ri as an ego-booster and a mental tonic to his vanity. I loved following his gradual reliance (behind an unwilling façade of course) on Na Ri as the sole person he can entrust his secretive cancer matters with. Still, it was quite satisfying to watch him savor this deserving adversity, and battle the ever growing jealousy incarnating in him. However, Na Ri’s eventual triumph in the news anchor audition became a pivotal moment that refashioned my perspective about Hwa Shin and Jung Won. Both of them did a great job in helping her reach the height of her ambition, but the gravity of Hwa Shin’s sacrifice made his love seem bigger, and totally won my admiration this time. Affairs reach a breaking point in this section of Jealousy Incarnate. Trouble starts to ferment between our characters, and my heart sank along with all the severing connections. After playing cupid between his friend and his beloved, jealousy continuously provokes Hwa Shin beyond endurance, and his plan to hold his feelings back for Jung Won’s sake proved futile. But oddly enough, it wasn’t Hwa Shin’s belated confession to Na Ri or his jerk-to-sweetheart metamorphosis that served as the game-changer here; it was Na Ri’s wavering emotions. I find myself outraged at her character for the first time, seeing how easily she dismissed loyalty for Jung Won over the emotional stir Hwa Shin is giving her. But it was even more frustrating to see the absurd cohabitation she proposed to settle the matter, which only ended up hurting both guys more. My heart really broke along with Jung Won who’s only mistake is having unreserved love for Na Ri. As expected, Jung Won’s friendship with Hwa Shin became tainted because of this awkward love triangle. The two of them going bender and losing their cool over Na Ri created so many hilarious moments for the viewer at their emotional expense. At the same time, the drama was able to showcase the deep-seated friendship between them despite all the hurly-burly. The drama was able to showcase the deep-seated friendship despite all the hurly-burly. Though tension might be at its peak, but we’re blessed with an entertaining sight in the brewing affinity between Ja Young and Sung Sook. They were repugnant with each other all this time for having similar fortunes and misfortunes, but I was enthused that this resemblance in taste eventually began to form a lovable rapport between the two. Their harmony was so amazing that they totally counteracted all the emotional disarray from watching our leads. Passion runs high as the real romance between Hwa Shin and Na Ri starts to whip into shape during the final episodes of Jealousy Incarnate. The epiphany of Na Ri’s true feelings soon took place, yet I was disappointed to find Hwa Shin distancing himself even after her confessions. But the real reason behind it got my heart swooning for Hwa Shin once more; his consideration for Jung Won held him back from immediately dating Na Ri. These episodes did a great job showing Hwa Shin’s charming side, like when he proposed to Na Ri, that more than compensated his love arrears for her. Marriage has always been my ideal ending, so I was very pleased to see the happily-ever-after aftermath of Jealousy Incarnate. Moreover, not only do our leads reaped a sweet ending, Ja Young, Sung Soo, Chef, Chi Yeol, and Ppal Gang all received their fair share of blessings. Jealousy Incarnate sure has implanted itself deeply in my mind, with mind-twisting metaphors and groundbreaking takes on stereotypes. Even seemingly insignificant details like the hidden ramen cup (which I interpreted as “something hidden, but has always been there”), and Hwa Shin hitting Jung Won at the back during their sparring session (which symbolized blindsiding Jung Won), surprisingly added up to its premise. Just like Hwa Shin stated that he’d always be curious about Na Ri, I felt the same about Jealousy Incarnate – constantly curious until everything concurred to a successful ending.